"The BA Team consisted of seven club members and a few friends and family - total fifteen. This made us a small team amongst nearly 1,000 entrants from around 60 airlines. 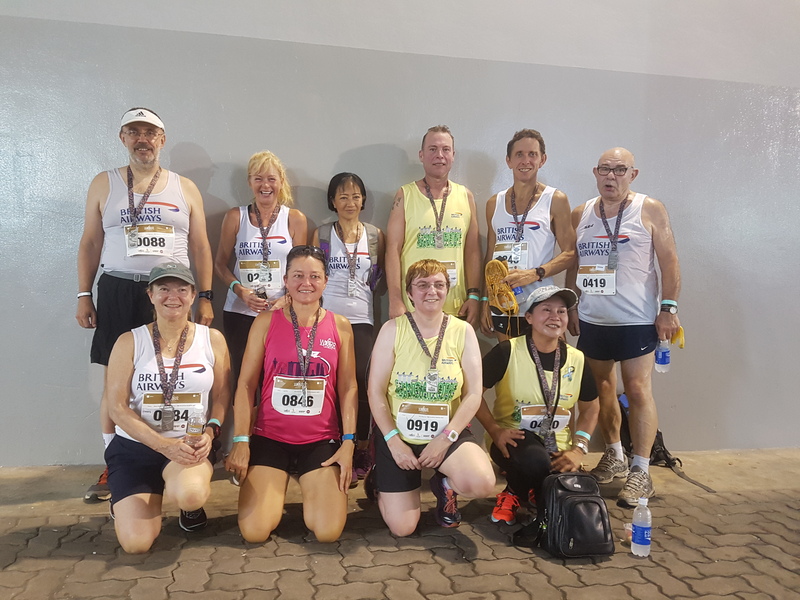 The event itself was very successful with the Singapore Airline's host having arranged the best possible Singapore location for the races, around Marina Bay, and they were well organised and marshalled. There was the usual awards evening banquet and the other event parties and all went very well - I didn't hear anyone, from any team, complaining about anything (other than the beer prices in the Race HQ hotel). The British Airways team won the first trophy - the annual T Shirt Design trophy for having the best event shirt. This is WARR's only non-running related award and this was our first success since 2002. In the races the team were led home by Adrian Haines finishing overall 2nd in the 5k (and he was disappointed not to be first). His sister also finished third in the non-airline masters category. Helen Smith was surprised and delighted to finish third in the 60-69 category. We also had one award in the 10k with Michelle Garratt coming second in the 50 to 59 year category. We didn't have enough runners to seriously compete in the team competitions. Next year WARR will be held in Victoria, British Columbia, Canada - hosted by Air Canada and Jazz. The milder temperatures are likely to suit our runners better and we would hope to attract enough of our better runners to also challenge in the team results."